Given the success of Blizzard Champion Discs, we wanted to expand the technology to other areas of disc golf. Tee pads were the obvious answer. Generally the heaviest, most labor intensive and permanent pieces of the course, tee pads can be a headache for course designers and temporary courses. All that is history with the invention of Innova® PortaPADS™. We’ve created a proprietary blend of lightweight moisture wicking concrete by incorporating our innovative Blizzard Technology. Our PortaPADs are 14% lighter than normal concrete tees making them more movable. At 60″ wide by 96″ long, they will easily suit your needs for one day events, additional tees, or testing out new course designs. Moisture wicking, means these tees will stay dry and maintain traction in even the wettest of climates. The next time you want to set up a temporary course, or add new tee locations, don’t settle for natural tees. 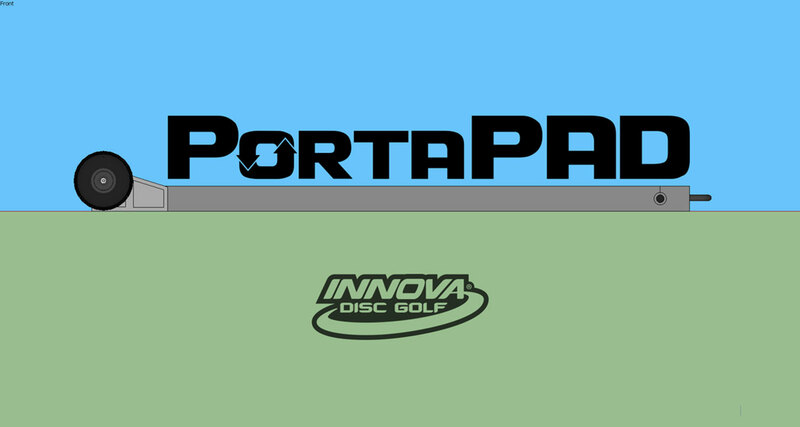 Let your players tee on concrete with our new INNOVA PortaPADs! INNOVA PortaPADs are always smooth, always dry and always perfect for teeing. 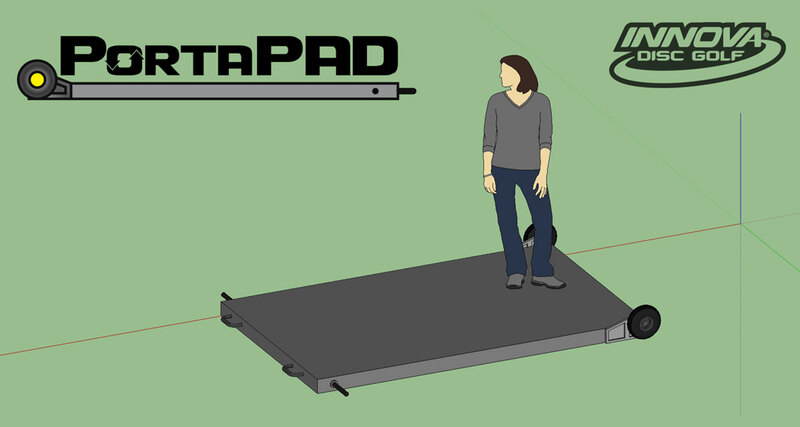 PortaPADS can be easily installed, moved or even removed in a just few hours. Innova PortaPADs conveniently allow multiple tee positions for every hole on the course for the cost of a single tee pad. Easy to Relocate! Just Flip and Go! To relocate the PortaPAD, grab a friend and simply flip the pad over *† and it’s ready to move to a new position‡! 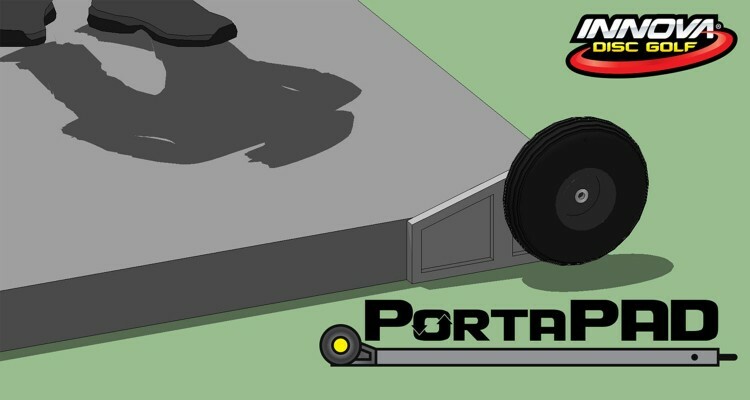 Built in easy-roll wheels†† and convenient handles make moving PortaPAD tees a breeze†††. Many park departments do not allow permanent concrete tees. The Innova PortaPAD tee with Blizzard technology provides the solution. Bring your tee to the course with you‡‡! Innova PortaPAD™ – Always smooth, always level and always perfect for teeing. Custom textures, colors and graphics are available. Course discounts available on the purchase of 9 or more PortaPADs. Please call for more information and for a personalized shipping quote. * PortaPAD™ flipping should not be attempted by those over the age of 65. † Do not attempt to move PortaPAD™ while pregnant, unless you’ve already had twins. ‡ Do not attempt to move PortaPAD™ on grades of more than 9%. †† Always keep PortaPAD™ tires between 85 and 100PSI. ‡‡ Check your vehicle payload capacity for hauling capabilities. 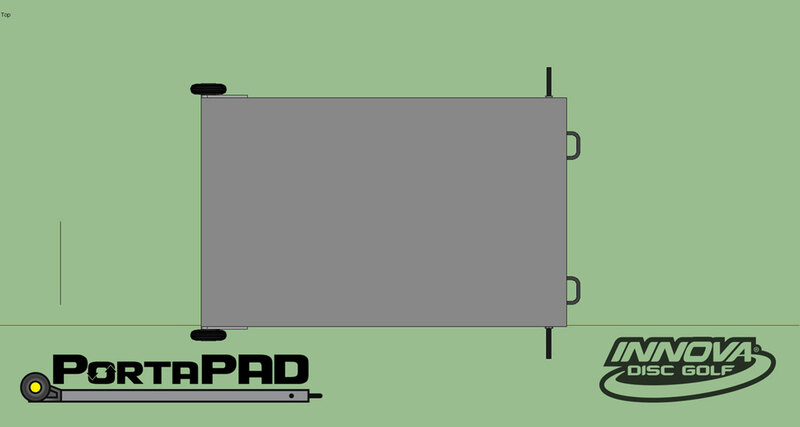 At 1700 pounds, PortaPAD™ will void manufacturer drivetrain warranties on most ¾ ton pickups. ††† Innova requires liability contracts for all PortaPAD™ purchase and rentals. Innova is not liable for damage or injury for proper or improper use of PortaPAD. ‡‡‡ Do not taunt PortaPAD™. As many of you have guessed, the McBuyout was our April Fools prank this year. We hope everyone had a good laugh with us.